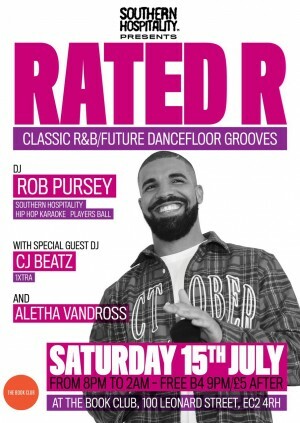 Rated R is a night of timeless R&B and future dancefloor classics, with some classic rap jams thrown in. Playing all great soulful music from the last few decades and beyond – think Janet Jackson to Mary J. Blige to Pharrell to Miguel to Tinsahe. This month sees the legendary CJ Beatz jump on the set with Southern Hospitality resident and founder Rob Pursey.